When you’ve got your nose in a good book, or indeed, a particularly hard crossword, it’s easy to ignore the time of day slowly passing you by. Without you realising, the light in your room slowly dwindles, causing your eyes to strain as you read the small text. A light for reading may just turn out to be a solid investment. A reading light directs light into your line of sight, providing you with a clearer, brighter ambience in which to read. Reading lights are usually fully adjustable, so you can select the right level of lighting for your needs; some particularly techy ones are self adjusting, so you’re never a step behind when it comes to keeping up with the ever changing light conditions in your room. Some manufacturers of lights for reading claim that different types of light can affect the way in which you read. For example, the people behind our third pick, the BenQ WiT Genie e-Reading Desk Lamp, believe that warm tones are best for casual reading, while cooler tones are better for concentration purposes. Some lights, like this one, allow you to change the tone as well as the brightness, allowing you to create the optimum lighting condition for you. Before you purchase a reading light, you should consider the best option for you. Lights for reading come in all shapes and sizes. From out first pick, Serious Readers Alex Dimmable LED Floor Lamp, which is a standing lamp and is ideally suited for placing behind your favourite reading chair, to a clamp light, like the Trond Task Lamp, which clips on to your desk for optimum light conditions as carry out your work. Clamp lights tend to be the best choice if you’re particularly budget conscious. Decorative lights for reading, like our first and second pick, are less friendly on the pocket, but they add something to your home, offering something more than just an accessory. If you’re looking for a decorative light, John Lewis and Argos often have specific products in stock. Otherwise, reading lights are a fairly niche thing, so for the biggest selection of the best lights for reading, Amazon is certainly worth checking out. While it perhaps lacks the flair of a more decorative light, when it comes to putting your nose in a good book, this floor reading light from John Lewis probably takes some beating. Its stature is understated enough to sit quietly behind your favourite armchair, and with a fully adjustable head, you can position it just so. It emits a warm glow, perfect for casual, everyday reading, and is dimmable so you can adjust the light to the right level. Sometimes the soft glow of a bedside table lamp doesn’t quite cut it when it comes to sticking your nose in a book for a couple of chapters before you go to sleep. With that the case, investing in a sleek and stylish wall light that can be hidden away when not in use could be just the ticket. 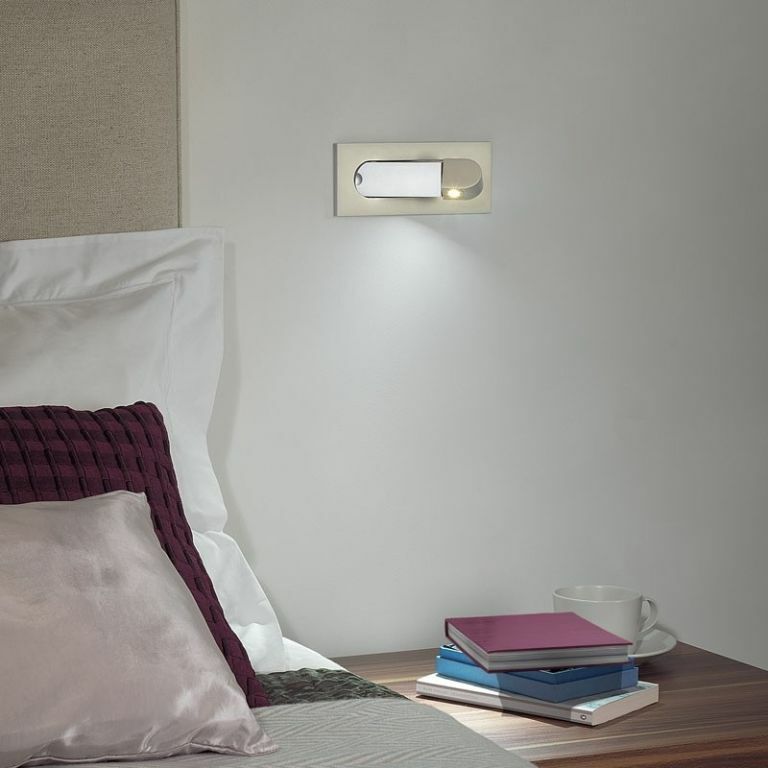 Emitting a warm, but powerful light, these wall lights are ideal for casual bedtime reading, and can be easily swivelled to point the light at just the right angle. Although not the most traditional in appearance, when it comes to techiness in lamps, we’re pretty sure this one can’t be beaten. The designers have thought of everything: from the built-in ambient sensor which detects your surrounding light conditions and adjusts the level of light along the length of the lighting strip, to switching up the type of light so you can benefit from either warm or cold light for different reading scenarios. On top of its techy features, it does have some design flair, with a range of colours available. If you’re looking for a techy lamp for less, than you may have to compromise on the appearance of it. This Trong Task Lamp doesn’t have any redeeming stylish qualities, but it’s ergonomics make it absolutely perfect for purpose. With five lighting modes and a five-level dimmer, you can create the right environment for casual reading or intensive studying, and switch around the brightness of the light as conditions change. To avoid a clash of wires around your working area, you can use the USB port at the back of the light to charge up your phone or smart device, and there’s even a light timer to control how long you want the light on for if you’re finding it hard to get your nose out of your book. If you’re someone who has to take their book with them wherever they go in case there’s an opportune moment to speedread a couple of chapters, this book light could be the ideal buy for you. Whether you’re on the train, the bus, or stuck in a dimly lit waiting room, this rechargeable book light will be able to provide a warm bright light to prevent your eyes from straining. While it doesn’t feature as many adjustable settings as other lights, it’s good to know that the battery can last for as long as 60 hours on the lowest setting and 10 hours on the highest. The older Kindles and competitor e-readers don’t have a backlight, which can make reading in dim environments a bit difficult. Whether you’re commuting or sat in bed and don’t want to wake the partner up by putting the big light on, this light for reading provides a warm glow that can be set at two different brightness levels. If you’re worried about the clamp scratching your device, it does have a protective layer to prevent damage and if you’re worried about having to replace the batteries every five minutes, the bulbs are LED, so use next to no power. We’re all guilty of it – falling asleep with our nose deep in a good book. If you make a regular habit of it, this light for reading may be the solution. If you want to get a couple of chapters in before bed, you can set the timer in 15 minute intervals, so if you’ve fallen asleep before the half an hour is up, you know your light isn’t going to be on all night. If you think you’re in for a big session, you can turn the light to constant on, too. Not got any good books to read at the moment? Head over to our colleagues at The Radar and check out their top 10 non-fiction books on the shelves right now.